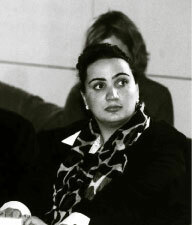 Shukria Barakzai Dawi, founder and editor of Afghanistan's first women's magazine (Photo: Deutsche Siftung für Internationale Entwicklung). Dawi didn’t need to change her views overnight: She loathed the restrictions all along. After the Taliban came to power, Dawi’s parents and her six siblings fled the country. Dawi and her husband, a wealthy businessman, decided to stay. Forced to abandon her studies in geophysics at the University of Kabul, she vowed to defy the newly imposed rigid restrictions on women, and from the confinement of her home, she headed several underground schools. Then, in early 2002, she founded an aid society for women called “Asia Women Organization.” In the group’s three learning centers, two teachers give 210 young girls and 70 women a basic education. A trade school teaches women sewing, and Asia’s medical center has become the only health-care resource for hundreds of female patients. Now, Dawi has begun to provide for their intellectual stimulation as well. On Feb. 5, she launched Afghanistan’s first women’s magazine, Aina-e-Zan (Women’s Mirror), which she also edits. With an initial run of 1,000 copies, the four-page magazine is distributed free. Written in Dari and Pushtu, it gives women an unbiased, gender-equal forum to air their views. Dawi’s husband provides funding. “There is still much work to be done, and this is only the start,” she told Yvonne Ridley of London’s Sunday Express. “I have been overwhelmed with stories submitted from women who want to publish.” No one has objected to the new publication—yet. The Northern Alliance, however, keeps a watchful eye, because Aina-e-Zan’s declared mission is to increase women’s awareness of political, social, and cultural issues: still an audacious undertaking in the country. Women in Afghanistan are slowly adjusting to the post-Taliban environment. Men, however, seem to have a harder time adapting. Dawi’s driver is embarrassed by her conduct and urges her to cover up. “I am ashamed to work for a woman,” he admits. But Dawi just chuckles at his remarks. They don’t discourage her.